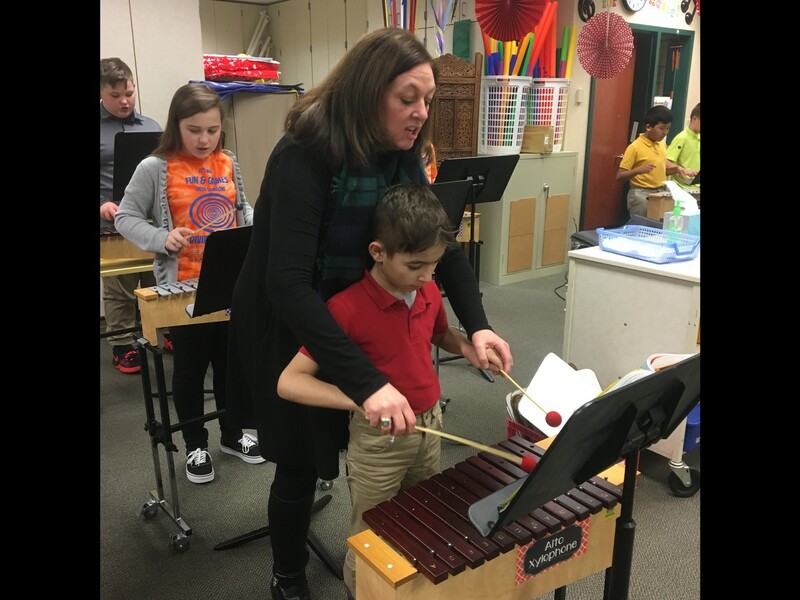 Lisa Goss, the music teacher at Jeremiah Gray Elementary, taught students how to play "The Lion Sleeps Tonight" on xylophones while focusing on two SIOP components - Strategies and Practice & Application. The students first listened to the CD of the song to refresh their knowledge and followed along with the sheet music projected on the board. Mrs. Goss then reminded students to "Say it as you play it" so they would be playing the correct notes as they were being said aloud. She modeled by singing the notes verbally and providing hand motions where each note fell on the staff and then modeling which hand would be used for each note on the xylophone while playing the song. All of these strategies demonstrate the specific feature of using scaffolding techniques consistently to assist and support student understanding. 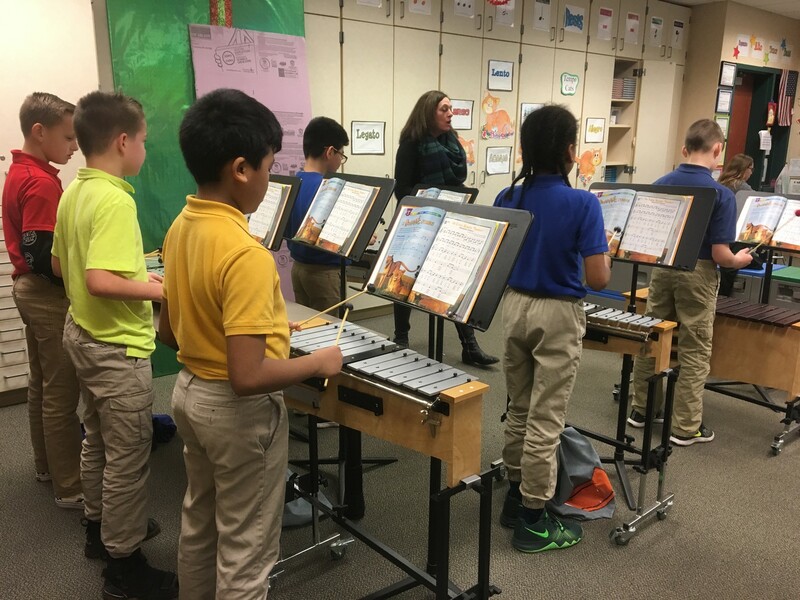 All students were able to be successful with this scaffolding and it was particularly helpful to our EL students:) The students then spent thirty minutes of the 45 minute period practicing the xylophone with purposeful focus from Mrs. Goss, then in smaller chunks (i.e. just the chorus, or verse) and finally attempting the entire piece. This gradual release provided the students with 2/3 of the class time for practice which supports the strategies component of providing ample opportunities for students to use learning strategies and the Practice and Application feature of hands-on materials and/or manipulatives for students to practice using new content knowledge. The SIOP checklist is intended to use for our planning of entire units for the success of our English Learners, but this lesson hits multiple features of several different components - we just wanted to draw attention to at least two. Great student work = Great learning and we love seeing the great teachers in Perry. Thanks for allowing us to come visit your room, Mrs. Goss! Meaningful Practice allows teachers the opportunity to observe the extent to which all students understand new information and concepts. Explaining how to ride a bike and actually riding a bike are two very different skill sets. It is imperative for learning that students have the opportunity for transfer. Quescussion is an extremely interesting idea - only asking questions is allowed! What topics do you discuss in class that would be rich enough for this type of activity? An English learner is reclassified as fluent or English language proficient when they achieve a 5.0 overall composite score on the annual WIDA ACCESS assessment. Students are reclassified as proficient in English and enter a two-year formal academic monitoring period to ensure they are meaningfully participating in the district’s educational program. 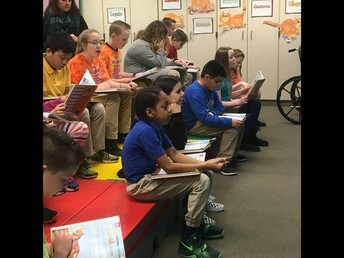 Perry Township monitors all level 5 students every Quarter One and Quarter Three. Former English learners are meaningfully participating in the standard instructional program in a manner comparable to their native English speaking peers. When an academic or language need is identified during a former English learner’s two-year monitoring period, it is important to consider that all students, regardless of English proficiency or native language, can struggle with core content areas. In some instances, students may meet the state criteria for reclassification as fluent without having truly attained English proficiency. In these cases, formal reentry into the English learner program may be appropriate. This process may also be implemented to reevaluate the English proficiency of students who were identified as fluent upon enrollment through the W-APT or WIDA Screener.